Defeat by Novak Djokovic in the World Tour Finals championship match will not sour Rafael Nadal's season. After 10 titles and 14 finals from 17 events on his return from a career-threatening knee injury, 2013 will be remembered for the rebirth of the now 13-time Grand Slam champion. But in this exceptional age of men's tennis, if you don't move on you get left behind. Djokovic's third end-of-year title was chalked up in commanding style - and his 22nd consecutive win serves notice that the man who won one and lost two other Grand Slam finals in 2013 is expecting to raise the bar next year. Nadal and Djokovic have been the supreme male players of 2013 - each compiling at least twice the number of ranking points of the world number three David Ferrer - but for British fans, the most glorious moment came at 17.24 BST on the afternoon of Sunday 7 July. When I returned to Wimbledon's Centre Court last week, the scoreboard was still showing the same time and the 6-4 7-5 6-4 scoreline by which Andy Murray beat Djokovic to become Britain's first men's singles champion for 77 years. The weather had changed a bit. The temperature had dropped by about 20 degrees, and steady rain fell onto the reseeded turf now protected by an electric fence. Murray was still there but, with a back that needs protecting from a cool and nagging wind, his memories of that exceptional moment were best shared in the warm. That July day had started routinely as he shared breakfast on his patio with his mum Judy and girlfriend Kim, even if he had dreamt the night before that his opponent in the final would be either the world number 45 Radek Stepanek, or the world number 109 Denis Kudla. "Dreams don't really make sense, but obviously when you wake up and you're playing the world number one, it's a bit different," he said, with a hint of understatement. On-court temperatures that Sunday afternoon peaked at a fraction below 50C. Murray took the first set by two breaks of serve to one, won the second from 4-1 down, and after a similar comeback in the third set, found himself serving for the title at 5-4. Three match points came. And three match points went. "As I went down to pick up the towel [at deuce], I saw my arm and hand shaking and I've never had that before so I kind of realised that I was feeling the nerves a bit," he said. "You can imagine, with everything that is going on, when you look down and your hand is actually shaking, it doesn't help things." Murray then had to save three break-back points - the second after a 21-stroke rally. "If I had lost that game I think mentally it would have been very, very tough to come back from. And you can see in that last game that physically I was really struggling. It was so hot, I literally could barely breathe," he revealed. Fortunately, a fourth match point soon followed. "I hit a huge serve out wide," Murray recalled. "It was about 130mph, and I thought it was over because I saw him taking one hand off the racquet and it's pretty hard to control a ball that is going that fast with one hand. "The ball like looped up. I remember then that everyone was kind of gasping because they thought it was going out, but then it dropped right on the baseline. Thankfully he missed the next backhand into the net, and that was it. "The next few minutes were just a bit of a blur. I didn't know exactly where I was or who I was going to, or what I was doing." Murray, who talks in more detail about Wimbledon in his new book 'Seventy-seven: My Road to Wimbledon Glory', eventually found his compass, and clambered through the crowd to the players' box. The first man he embraced was his coach Ivan Lendl. "We'd hugged a few times but he doesn't often do that in public. 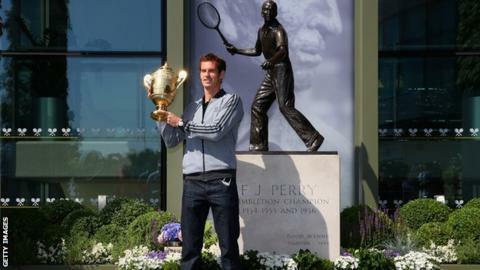 I don't know how much he enjoyed it, but it was nice to go up there and see them," said Murray. "The other guys that I have been working with for five or six years, they've seen me lose a lot of those matches, so to go up and see them after that was nice." His mum Judy was a few rows back, and he successfully located her just in time. "Luckily I didn't completely forget about her," he said. "It was tough because when I watched the last game back, there are a couple of points when they had gone to my mum in the crowd. It actually makes you feel bad as you can see how much stress you are putting them under. "I saw her when I lost one of the match points - she kind of stood up and was sort of saying 'it's OK, it's OK', and I could just see in her face that she was not OK, and it wasn't OK at that moment. "She was struggling a little bit to keep it all together, and I think after the match she literally didn't even look at me - she was just bursting into tears with whoever was next to her." Life as a Wimbledon champion had just begun. Murray didn't enjoy being pursued by photographers for the next couple of days, but says they soon left him alone when it became apparent they weren't going to catch him falling out of nightclubs. The quietest place he could find in the days that followed turned out to be the scene of his greatest triumph. "I went down on to the court and there was literally no-one there. It was silent, and I just sat there for a little bit because at the time you don't really get the chance to enjoy it, and let everything sink in." You can hear more from Andy Murray from 19:30 GMT on Tuesday, on 5 live Sport on BBC Radio 5 live.